Divorcing Parents’ Class | STEP-Carefully! for Stepparents! This is a two hour class for divorcing parents to help them understand the new relationship they have with each other and with their children. The purpose of this class is to help families who have been or who are in the process of being divided by divorce to survive and to raise healthier, happier children. This class meets the Arkansas requirements for parenting classes or mediation as required for divorcing parents of minor children. Although usually only parents are required to attend these classes, we’ve found that it can be helpful if other family members, such as grandparents or stepparents, attend also so they can help in the development of the new family structure. Divorcing couples may attend together or separately. If possible, attending together often helps avoid questions and confusion later on. Use your own discretion. One of the main reasons I teach this class is because I have been divorced myself. I understand what you’re going through, I’ve been there. Divorce is one of the worst experiences that can hit a family. And I’ve had over 20 years’ experience teaching broken families how to succeed. With the Parenting Together© class, I can help divorcing parents understand how to handle their new situation better, and how to help your children survive the upset more successfully. >> You must reference our CLASS SCHEDULE for class dates each month. Call 479-522-7490 for full information. * Click HERE for a map and directions. * I also offer Private Classes if you can’t make the regular scheduled classes. > The fee for this class is $20 per person; cash or money order, no checks or credit/debit cards, please. > Please do not bring your children, the topics can be upsetting to them and child care is not provided. I also provide private meetings. GO HERE for full information. This detailed guide includes everything I have learned through over 20 years working with divorced and divorcing parents and their families. 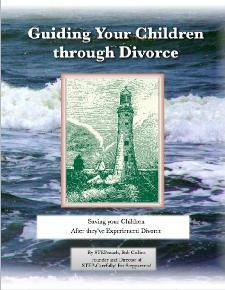 The Divorcing Parents’ Guidebook is a complete, detailed manual that will answer your questions about your childrens’ needs by age group, type of divorce and family make up, as well as how to handle the stickiest issues that come up between divorced parents when they are trying to raise healthy, well-adjusted children in two separate homes and families. * NOTE: this link will open a separate page and transport you to another site (my stand-alone Family Mediation site). To return here, either click your browser’s back button, or close that new window.